Are you looking for a small size, powerful beverage maker then Tassimo T12 will be a great choice. In this article we are going to review and talk about it’s features. Tassimo T12 is durable, long lasting and has great features but is not expensive. It is small, sleek, slim and compact. If you have small size kitchen then this will be a perfect pick as it comes with space saving characteristic. It easily fits in any tiny sapces. It allow you to choose from 35 different varieties of drinks, from latte to tea and even hot chocolate. This feature is really awesome because people or kid who don’t like coffee can enjoy other beverage. It has removable 0.7L tank that very easy to clean, easy to remove and refill it doesn’t become a problem. It can can makeup to 3-4 drinks. On front right hand side, there is operation button. It does look as three button but there is simple big one and there are three lights on it that let you know you when its on when the water tank needs filling and when the machine needs cleaning. 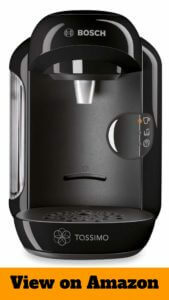 It comes with a barcode technology (Intellibrew system) that scans the drink you have selected and once this machine identifies it then it automatically adjust water that is needed for the drink. It’s energy efficient flow technology, heats only required amount of water needed for a specific drink. If you were looking for compact and durable beverage maker under $100 Tassimo T12 this can be a ultimate pick. It’s features are great one of the best coffee makers we have came crossed.